Artists are bashing Obama over drones and surveillance. That's racial progress. 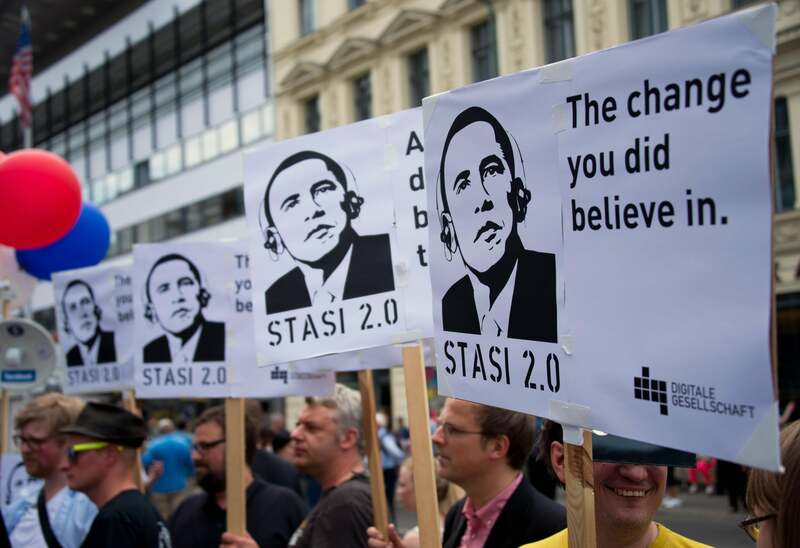 Posters depicting President Obama as a perpetrator of mass surveillance, June 18, 2013. Five and a half years into his presidency, Mr. Obama has had a powerful impact on the nation’s popular culture. But what many screenwriters, novelists and visual artists have seized on is not an inspirational story of the first black president. Instead they have found more compelling story lines in the bleaker, morally fraught parts of Mr. Obama’s legacy. I’m sorry these people feel betrayed. But their criticism isn’t a setback. It’s a sign of progress. Electing a black president was a big deal. It was, as Henry Louis Gates Jr. wrote in The Root, “the grand achievement of a great, collective dream.” For many Americans, it was proof that we had finally transcended race. But part of transcendence is getting over the achievement. You can’t spend eight years celebrating the election of a black man. You have to let him do the job and take the lumps. That’s why these critical paintings, plays, and movies are healthy. They’re a sign that we’ve moved on. Artists, like others on the left, are no longer fawning over Obama because of his color. They’re treating him like any other president. And they’re discovering that a guy with roots in Kenya and Kansas can be just as vigilant, pragmatic, and lethal as the white men who came before him. Our 43rd president talked about the soft bigotry of low expectations. Our 44th, in his first years in office, lived under those expectations. He was exalted as much for who he was—or, rather, who his admirers thought he was—as for what he did. Now he has to earn his praise and face the disappointment of those who idolized him. Judgment can sting, but the dream wasn’t to be judged perfect. It was to be judged on your merits.